The USB-C hub is able to USB Power Delivery. This enables full-speed New MacBook recharging while simultaneously connected to SuperSpeed USB 3.0, SD/Micro SD card, HDMI port. 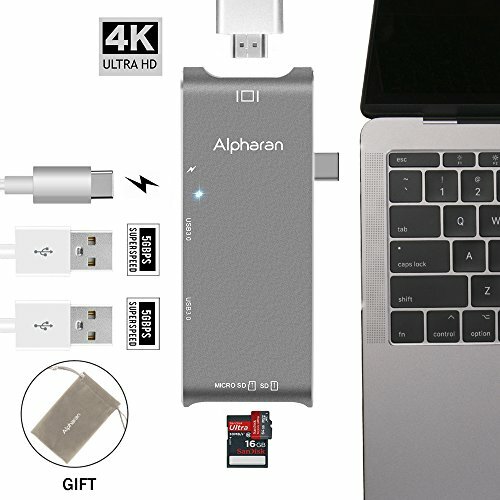 No WiFi Signal Interference: Unlike some type-c hubs that may interfere your WiFi signal, Alpharan USB C Hub will prevent your wireless connection from dropping. How to Use: Just plug and play to expand your MacBook's capabilities. The Type-c hub does not require any software, drivers or complicated installation process. Allow you to connect keyboard, mouse, thumb drive to MacBook Pro or other Type-c devices, and access files from SD card reader. What You Get - Alpharan USB C Hub + Flannelette Bag to Package + Alpharan 12-Months Product Warranty with No-Worry Return and Money Back. If you have any questions about this product by Alpharan, contact us by completing and submitting the form below. If you are looking for a specif part number, please include it with your message.